Today we ran a story about the Big 12 Conference alerting West Virginia about changes to their pregame performance. This information was very credible and our sources had direct ties to the Pride of West Virginia. Unfortunately some of the information that was sent to our writing team was not as accurate as we would have liked. We have spoken to the Pride of West Virginia leadership and have cleared up any mis-information. We would like to correct the following information. Our story indicated that the Big 12 had alerted WVU about changes that would impact pregame with four days to go until their first game. After speaking with the WVU Directors we have been told that this conversation has in fact been taking place over the last few weeks and the administration had been working to make the necessary changes. Their goal was to preserve the Pride of West Virginia pregame show and they did do that. As we reported, changes to their tunnel cadence have been made with 8 bars being cut by the drum line as it was already running too long in relation to the bands normal allotted time for it. These cuts are the only cuts being made to their pregame performance in any way and we were very pleased to hear about this. These cuts would have been made regardless of the Big 12 notification. 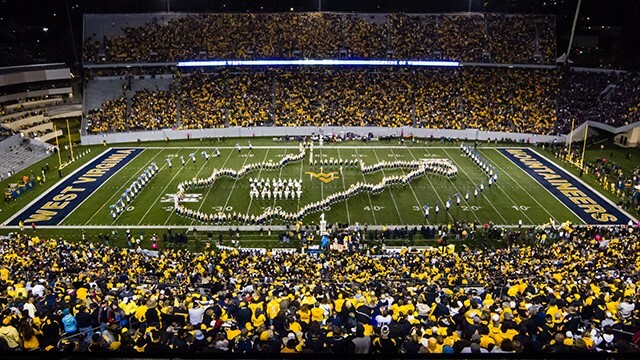 As members of the band community we take great pride in our relationships with college bands across the country and have had a superb relationship with the Pride of West Virginia administration, members, alumni and fans. On behalf of our team I would like to apologize for any frustration or confusion this caused today. As the head of the College Marching team, I will make sure that this does not happen again and have implemented new policies for sources. One thing that was made very clear is that the love for the Pride of West Virginia and it's traditions is unbelievably strong. We were so thrilled to have seen that on full display today. We look forward to bringing you the best from the college marching band world this season and appreciate all of your love and support along the way.